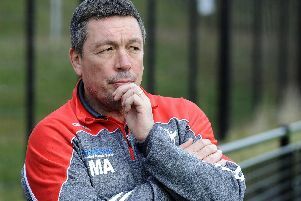 Catalans loan duo Stan Robin and Thibaut Margalet will have a big impact at Sheffield Eagles, says director Mark Aston. Alongside fellow new signing Nathan Chappell, Aston hopes that the latest injection of new faces will give his side a boost ahead of the final three games of the regular season, before the end of season showdown. “Stan is tough and strong, he has also got that little bit of grubbiness in him – we will see that more and more,” he added of Robin. Aston hopes that once his trio have firmly bedded their roots in the Eagles’ camp, his side will start to flourish. Aston will still be without versatile centre George Tyson for Sunday’s trip south to face Andrew Henderson’s in-form London side. The 22-year-old is sitting out the second game of a two match ban following his red card against Swinton Lions.